In 1966, a male baby, Chris, was adopted by an upper-middle-class Toronto family. From early childhood, Chris felt ill at ease as a boy and like an outsider in his conservative family. An obsession with sports - running, waterskiing, and cycling - helped him survive what he would eventually understand to be a profound disconnect between his anatomical sexual identity and his gender identity. In his 20s, with the support of newfound friends and family and the medical community, Chris became Kristen. Chris had been a world-class cyclist, and now Kristen aspired to compete in the 2008 Beijing Olympics. She became the first athlete in the world to submit to the International Olympic Committee's gender verification process, the Stockholm Consensus. An all-male jury determined she fit their biological criteria - but the IOC ultimately objected to her use of testosterone supplements. They, and other sports bodies, regard them as performance-enhancing, when in fact all transitioned female athletes need the hormone to stay healthy and to compete. So Kristen filed a complaint against the sports bodies standing in her way with the Ontario Human Rights Tribunal. And she won. 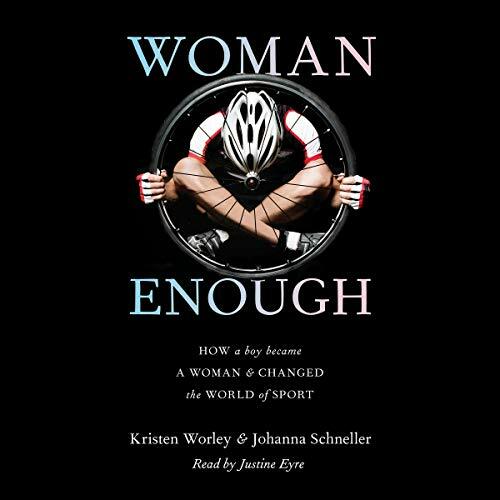 Woman Enough is the account of a human-rights battle with global repercussions for the world of sport; it's a challenge to rethink fixed ideas about gender; and it's the extraordinary story of a boy who was rejected for who he wasn't and who fought back until she found out who she is.